This true story outlines one woman’s battle against Australian bureaucracy to be reunited with her husband. In this book Robyn Oyeniyi details the relentless struggle she endured to marry an asylum seeker, reunite him with his children and bring her new family back to Melbourne to start a new life. It is a remarkable journey. Harry, I spent 30 minutes on the phone to Karen Burns because I was falling apart – I had to call her back after calling John, and I have to text her when I go to bed. I was having visions of driving my car through the door of the DIAC building – the only thing that stops me is that it would kill the case. I am telling you so that you understand I can’t hold my sanity together much longer. Tonight I was afraid of myself and my anger at the Government on one hand and my fear for my husband and children on the other. 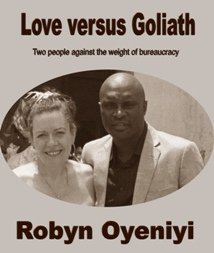 It is a fascinating story on many levels, and it’s engrossing to watch Robyn’s politicisation as she meets John, an asylum seeker in mandatory detention in Australia, and has to struggle for 14 months to reunite with him after he is involuntarily repatriated to Nigeria. John’s family history and connections in Nigeria and the complications of his situation are clearly set out; we get a strong sense of why people need to leave their countries because of violence and upheaval. Oyeniyi also writes well about the personal mental upheaval she and John go through, the constant worry and feeling of living under threat, while at the same time having to deal with the grind of forms and appointments with bureaucrats. She details the bureaucratic struggle as she tries to reunite with John, and its emotional impact. She argues finely for her case and the Oyeniyis’ entitlement to a happy family life. Underneath this textbook on how to deal with DIAC red tape is an inspirational love story about the way two people maintain a relationship thwarted by chance and circumstance; the story of getting the family back together is tense and stressful, with many false hopes and disappointments. Paper warfare. It becomes paper warfare and I understand why people just give up. Let Goliath win. The battle for fairness, respect and recompense is just too hard, takes too much time, too much effort. We poor taxpayers have jobs to go to, children to raise, homes to run. Battling Goliath just becomes another problem we don’t need, so we give up and they win. So it continues and nothing changes. This is a story with a happy ending and we share the Oyeniyi family’s joy as Robyn succeeds in getting her husband back and is reunited with his children. It is also heartening to read of the support that Robyn receives from her own children, colleagues and friends in her struggle to deal with the process. No matter how difficult it gets, there is always someone to help her over the line and to get up each morning. As a librarian, it is of interest to me that this book is self-published by Oyeniyi, who was determined to tell her family’s story, first as an ebook and then as print-on-demand. Love versus Goliath is an important resource and a book that should be in every school library in the land. I am the son of migrants and I value stories that broaden and reflect the identity of our culture. This is a true Australian narrative and an incredible story of one woman’s guts and determination. I am pleased to be able to share a new review of Love versus Goliath I trust may be of interest to prospective readers.